I have been looking forward to today. I designated it as a "not leaving the house till the whole thing is in tip top shape" day. Do you need those days, too? It seems like if I don't declare a day just for cleaning, organizing and purging (excess paper and stacks of stuff) the house just doesn't feel clean. Plus, once that's done I can play house without feeling like I should be doing something else. My grown up version of playing house usually has to do with rearranging furniture and adding new splashes of color. What can I say...I am easily entertained! 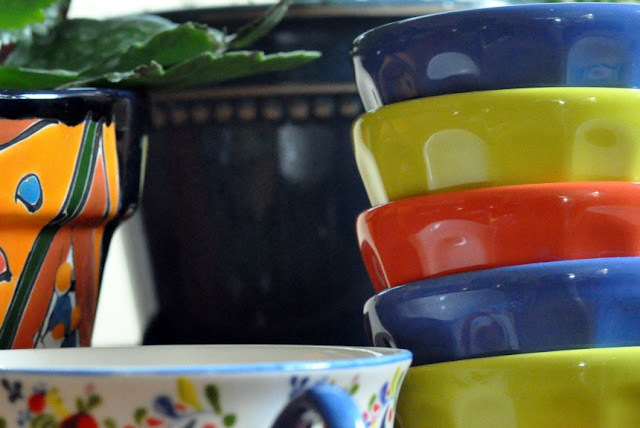 These are the color splashes I am crushing on right now. I am resting on my decision that our pale butter yellow walls are neutral enough and will contrast nicely with these scrumptious colors. I will also be adding generous helpings of white in the furniture and background fabric. Besides these pretty new bowls from Anthropologie, new mugs - one from Anthro and one from HomeGoods, and my new pot from Armstrong's, I found a quilt I cut out a couple of years ago that will be on my sewing list this week in exactly these colors. I also had my mom pick up a print we saw on clearance at Pier 1 last week that will bring a pop of needed color to the walls. I get so excited when a color scheme comes together. Now I'm off to clean my nest so that the guilt free fluffing can begin. Love the idea of butter yellow!! Oh yes, color is invigorating! I would LOVE to have a day just to clean! My house so needs it right now, as does the garden. Patty, have you been to a Hobby Lobby lately? I saw some pillows there the other day that I think you would love. They are very colorful with woven flowers in all the colors that you have in your post. Hugs to you! Thanks for the sweet comment you just left, too. I love all the bright colors...I bet your home will look wonderful when you are done...it always does! Have a great day!! Yes, bright colours will look nice with the butter walls. 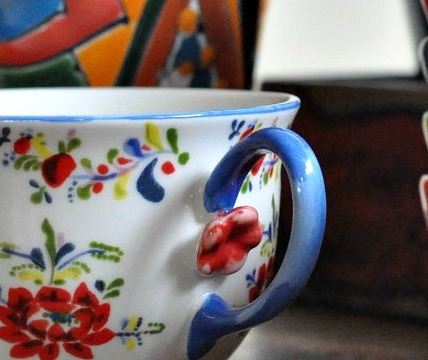 Love the tea-cups so much. 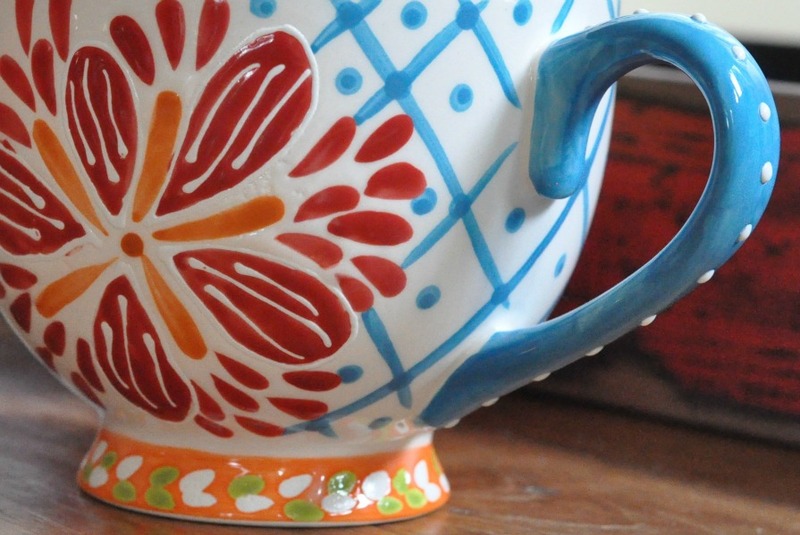 Just love the bold, bright colors! I guess I need to declare a cleaning day too and stick to it! I usually end up in my art room instead. Just the inspiration I needed to get on with my own "playing house", Patty. It sounds like you're having lots of fun. As for yellow walls, I love them! It makes for a lovely backdrop for plenty of other colours. I'll enjoy seeing how you pull things together. I fall into that category. Fun for me is cleaning and then rearranging. Those colors are just gorgeous! I love the Rose Bowl Flea Market. I have a niece who lives in LA and I come out a couple of times a year and that is on the top of my list!! Maybe we can meet up some time. That would be so fun. She tells me the Mood Fabric store is close to her house also and so now, that's on my list for some place new! Could you come and help me with my house? I seem to have to repeat clean everyday! Sorry, a tad bit overwhelmed right now! Love all of your fresh colors! Beautiful! I love the bursts of color -- how cheerful. 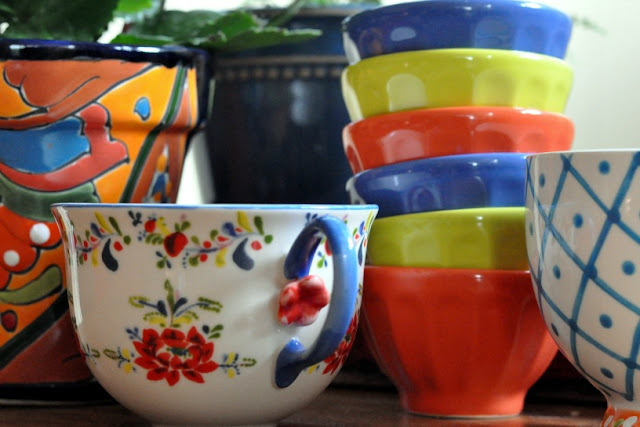 Your dainty and delightful bowls and cups are something any colour happy girl would have a crush on! I happen to ADORE colour and have painted my great room and hallways the butter yellow you are considering, and love it! 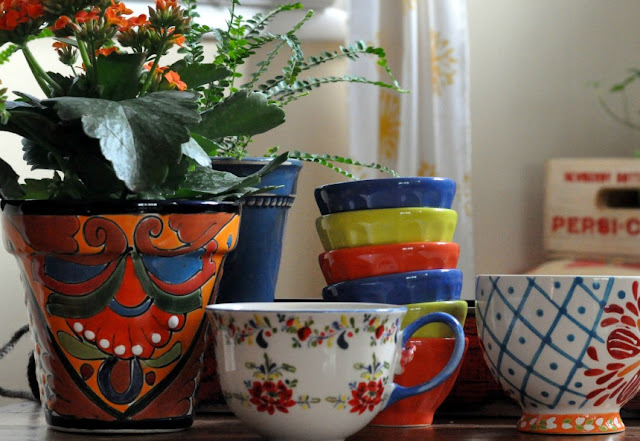 And, my kitchen is dressed in EXACTLY all the rich, primary colours of the French countryside and in that gorgeous Cadiz mug from Anthropologie - what a stunner!! It melts my heart every time! Love all of those colors!!! I am one that has to clean like that too. And then I feel okay again. I can't wait to see what you are up to next!! I love it!!! Your post was so inspiring and I love the fun bright colors . . . it looks like a fiesta! I love all of your color. 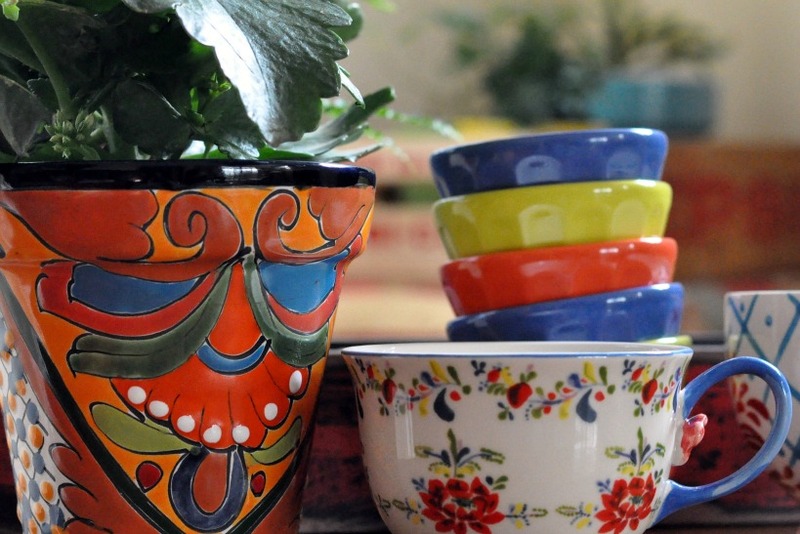 Your new pot looks like the Mexican talavera ceramic ware I collect. Ooh, love all those pretty colors! All my favorite colors, Patty. What a cute little stack of bowls. Great mugs too!